My family loves eating bread, but some evenings, after school, work, and afternoon activities, there isn’t much time to bake a whole loaf in time for dinner. We recently re-discovered focaccia bread, however, and it has been a quick way to put bread on the table. Focaccia is terribly delicious; it’s a perfect accompaniment to pasta or soup, and it even makes great afternoon snack. While focaccia can be topped with all kinds of ingredients, we prefer ours rather simple: onions and rosemary scattered on an olive oil-dough flatbread. We even keep the ingredients light to promote nice browning, and the results are a well-flavored bread with a crisp crust. 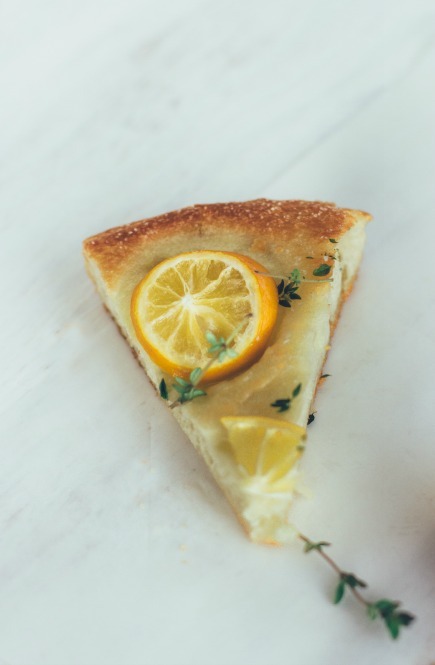 If you’re feeling more adventurous you can try our Meyer lemon-thyme version; Meyer lemons are much sweeter than regular lemons and are a delicious option. To make the dough: Use our dump and stir method of mixing the dough in a 5-quart Container with Lid, using a Danish Dough Whisk or wooden spoon. Then cover the container, not airtight and let it rest for about 2 hours on the counter. The dough can then be used right away, but it is much easier to handle once it has been thoroughly chilled. The dough can be stored in the refrigerator for 2 weeks. Preheat a baking stone near the middle of the oven to 425. Pour 2 tablespoons of olive oil into a 9 inch cake pan and evenly coat the bottom of the pan. Set aside. In a skillet, saute the onions slices over medium heat in 2 tablespoons of olive oil until softened but not browned (if you brown the onions they’ll burn in the oven). Set aside to cool slightly. Dust the surface of the refrigerated dough with flour and cut off a 1-pound (grapefruit size) piece. Dust the piece with more flour and quickly shape it into a ball by stretching the surface of the dough around to the bottom on all four sides, rotating the ball a quarter-turn as you go. Using your hands, flatten it into a 1/2 inch thick round. 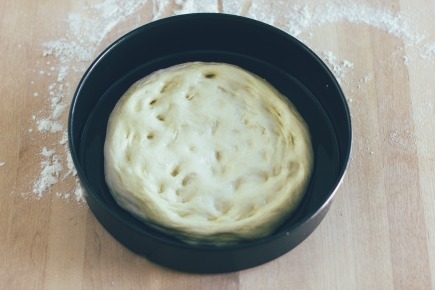 Place the dough top side down into the cake pan, and move it around a bit to cover it in olive oil. Turn the dough over, cover the pan with plastic wrap, and let it rest for 10-15 minutes. Use your hands to gently push the dough to the edges of the cake pan. Strew the onions over the surface of the dough, leaving a 1-inch border at the edge. Allow some of the dough surface to show through the onion (you may have some leftover onions at the end). If you can’t see much dough surface, you’re using too much onion and your focaccia won’t brown attractively. Sprinkle with rosemary and coarse salt (to taste). 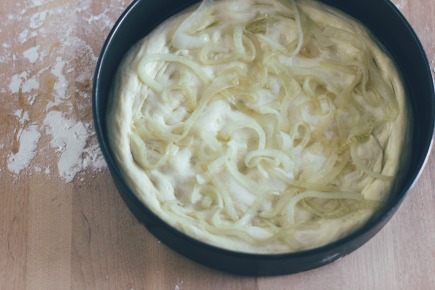 Cover the pan with plastic wrap, and allow the focaccia to rest and rise for 20 minutes. After the focaccia has rested, place the cake pan on the baking stone in the oven. Bake for 25 minutes, or until the crust is medium brown. Be careful not to burn the onions. The baking time will vary according to the focaccia’s thickness. Cut into wedges and serve warm. 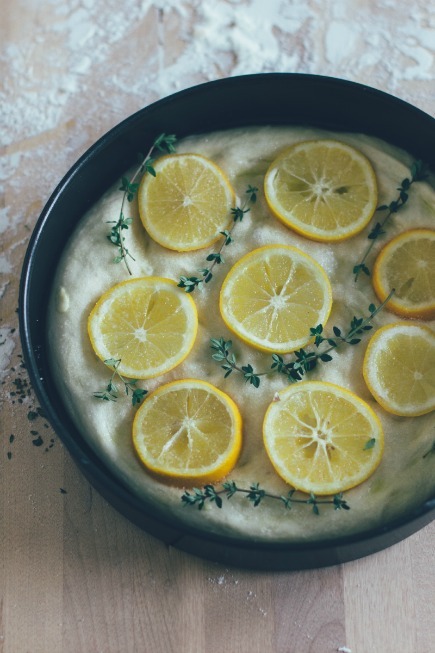 Thinly slice the Meyer lemons, and arrange them over the focaccia bread after gently pushing the dough to the edges of the pan. Before putting the bread in the oven, sprinkle 1 tablespoon sugar over the top of the bread, and then sprinkle with coarse salt to taste. This looks so good. How many loaves does this recipe make? If you make one-pounders as specified here, it’ll make four of these. If you use this same dough for pizza, we make that thinner, and you can actually get eight. Also makes nice loaf breads too. Would the gluten free dough work in this application? Lovely recipe!!! Will try soon! Btw, I had frozen my bread dough (the whole container), when I defrosted and tried to make a boule out of it, it did not rise :(. The bread was dense and hard. Anyways I used the leftover dough to make lovely naans to go with chickpea curry. Does the yeast die when you freeze the dough? This happened with master recipe from Healthy bread book. We routinely freeze dough with success. It does lose some rising power, but I find it’s still good. But don’t freeze too long, maybe that’s the issue? Can you please print your recipes in grams too going forward? In our books, we have (not the first one, from 2007). When freezing dough do you have any hints. Question on air tight zip lock bag ? Yes, I use those. Also jars, but put it in the freezer right away after closing, or the jar can actually explode (it won’t in the freezer, because fermentation slows to essentially zero). How does this focaccia differ from the recipe you have in the new AB in 5 book? Looks like there is more flour and water in this recipe. Yes, it’s just slightly scaled up to make more dough– but essentially the same proportions. We find that the yeast amount doesn’t matter, but if you’re finding it not salty enough, just use the higher end of that range. so sorry, one more question. Do you know how many grams of flour this would be? Also, if I made the full recipe, would that be about one focaccia bread and two pizza dough balls? I have been dying to make this since I saw it on pinterest. Many weight equivalents are in the latest books (none in our first one from 2007). For Healthy Bread in Five Min/Day, weights are only in the Master Recipe. The latest book (The New Artisan Bread in Five Minutes/Day) has the most weights– same for our Pizza book. 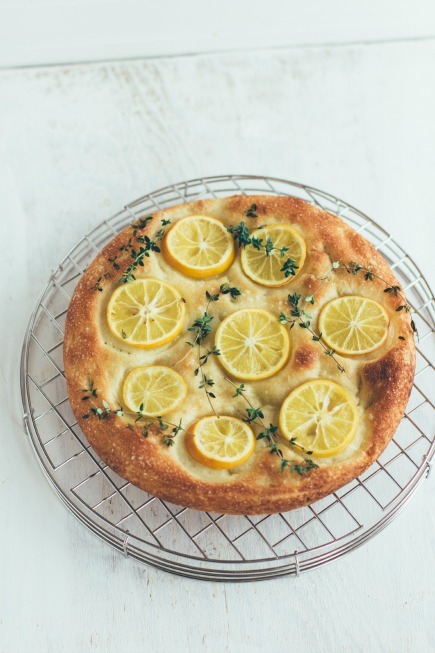 So gorgeous, love the lemon and thyme! I’ve been making something similar with the oil dough recipe from your Five Minute Bread (British edition). It’s a Pissaladière Niçoise. 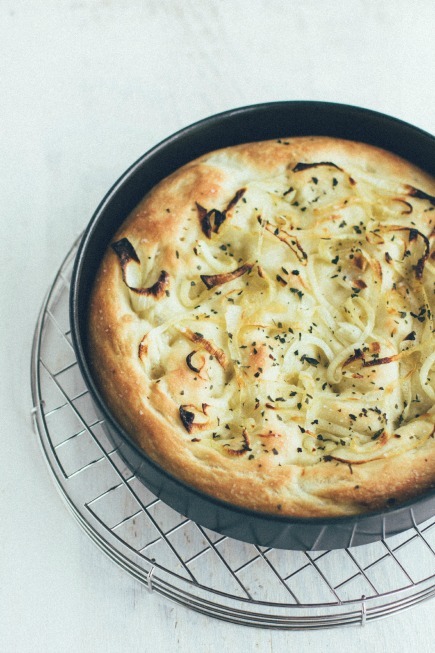 Make a focaccia as described, then pile on caramelised onions (up to half a centimetre deep – not sure what that would be in inches – a quarter of an inch maybe?) topped with black olives and anchovies in oil (drained). Leave to rise for 20 mins or so, then put in the oven at a slightly lower temperature than you give due to the amount of onion topping. If it’s for guests, I omit the olives and spread a very thin layer of black olive tapenade on the dough (tapenade at room temperature to make it easier to spread), so that we don’t have to deal with the olive stones. Anyway, I hope you don’t mind me mentioning this. It’s a regular as everyone loves it. I’ve been recommending your book to everyone I know and many I don’t, at least not in person, via the web. Congrats. Hope your new book is a success. Fantastic, thanks. A centimeter is about a half-inch (well a bit less, 0.45 inches). We keep waiting for the UK version of our book to take off, and have Nigella Lawson invite us over to do an 16-part TV series. Hasn’t happened yet! (so thanks for spreading the word). any news about the tv series?? Can’t wait!! Sorry Susi, we still haven’t gotten that call! I wish!!! you wrote on 9th May about Nigella Lawson and a 16-Part TV series. I only asked if you know something new. Thanks– I think sometimes my ironic humor doesn’t make any sense when I post it on the website (though of course we’d say yes…). I have no idea why your book hasn’t taken off in the UK. It ought to. Maybe it needs updating with some photos. It’s a great book, but the cover looks a bit dated. Hope you don’t mind me saying. Don’t mind your saying that at all, I agree with you 100%. I wish our UK publisher would agree to that, but it’s just not in the cards. This is true for all of our non-US books (China, Taiwan, and next year, Japan)–none of them have given us as much space for photos as our US publisher. That’s why we put so much photography and video here on the website. It’s all designed to support the books. Let us know if there’s anything in particular you’re looking for; the photo may already be up here on the site. No, I’ve not been looking for anything in particular. I love this site. But I know when I recommend your book that if people look at it on Amazon or elsewhere, some of them are going to go “nah”. In fact, I recommend your latest American editions seeing as you now give weights rather than just cups. Yes… I wish we’d seen that coming even sooner. Americans are starting to bake by weight, what an improvement. Agreed, though I’m sure lots of people who are used to using cups are happy carrying on as before. I can’t imagine cakemaking using cups, though. Just made this tonight. So delicious! I’m wondering why some breads can be eaten warm (like focaccia and bagels) but others you have to let cool completely before eating. Skinny, small or flat loaves can be eaten warm– their centers are so close to the surface that the bake through more thoroughly, and then cool very quickly. During that cooling phase, the proteins continue to set– in a thick, big, and round loaf, that takes a while. I use King Arthur flour exclusively and I weigh all of my recipes. I thought you have a conversion chart somewhere, because I think I should be using less KAF flour than others…but I can’t find that in….could you help me convert? For my baking to be the same as yours what should I weigh out for a cup of flour in your recipes for KAF flour? We have conversion charts in some of our books, which one(s) do you have, and then I can direct you? The only one that doesn’t use weights at all is our first book, from 2007 (Artisan Bread in Five Minutes a Day). The 2nd book, Healthy Bread in 5Min/Day (http://bit.ly/3wYSSN) has a conversion table, and the Master Recipe uses weights in addition to volumes. Our Pizza book (http://amzn.to/eo10NJ) and the re-issue of our first book (The New Artisan Bread… http://amzn.to/17Rw23Y) have weights included for all dough formulas, so you don’t need conversion tables for those (though we included it in Pizza). Conversion tables don’t appear here on the website, the publisher would kill us if we put all our content from the books here for free on the website! Yes, you need a little more water when you use KAF AP, see our FAQs tab above and click on “Flour varieties: Do I need to adjust the liquids when I use different kinds of white flour?” The conversion tables in the books don’t specifically address the question of KAF versus ordinary flour, it assumes all-purpose flour always weighs about the same, across brands. The question is how much water you need with it. I have used the master recipe(page 268) for gluten free bread in the New Artisan Bread in Five Minutes A Day. I continue to get wet, sticky middles even after weighing flours, using an oven thermometer, using a cast iron pizza stone, and baking longer. Please help! Please click on the “Corrections” tab above, then choose “The New Artisan Bread in Five Minutes a Day (2013).” You can update your book from there. Note that there’s another correction coming for the Gluten-Free Brioche, so hold off on making that. I was wondering, if in a pinch, instead of frying the onions you could use either onion powder or minced onion? Has anyone tried this? I’d be wary about onion powder, but dried onion flakes do work. My bread always splits down the side. I don’t believe it is because of the seam. That is carefully tucked underneath. I forgot the egg wash this time, but have done it in the past, and still get the split. I have used two different ovens, with the same result. What am I doing wrong? We have a few cinnamon-raisin variations, which one is this, in other words, which book, which page number? I should have thought of that, sorry! Also, while I’m thinking about it, I made the Ten-Grain bread (pg 111) from Healthy Bread in Five Minutes a day. I used Bob’s Red Mill brand ten-grain hot cereal uncooked. No changes to the recipe. The first time, I know I over-baked it. The second time, I don’t believe I did and it still seemed rather dry. Is that a sign that I still over-baked it, or could it be something else? OK, just like to orient. Have you checked oven temp with something like http://ow.ly/8CVPU ? If too hot, that could do this. Any chance you’re not shaping carefully enough (with a gluten-cloak), as in http://artisanbreadinfive.com/2010/03/08/new-video-shaping-the-ball-from-a-very-wet-dough or in http://artisanbreadinfive.com/2010/02/16/new-video-how-to-shape-a-loaf-using-whole-grain-dough ?? About the 10-grain, how are you measuring the flours? See our video on that: http://artisanbreadinfive.com/2010/04/28/how-we-measure-our-flour-using-the-scoop-and-sweep-method … Unless you’re weighing, in which case it’s moot. I missed the most obvious thing: Try slashing the loaf (you didn’t in the picture). That should take care of it. The easiest answer did the trick!! Thank you, Jeff. The slash worked. I know to slash the free form loaves, but I haven’t slashed any of the loaves I put in pans. I appreciate all the information you have given me. I have become a fan of weight measurement, and keep track of my oven temperature with a supplemental thermometer. Thanks for all the work you put into the books, and into the blog. So glad the slashing worked to fix the problem. We LOVE your books! I have become a regular bread-baker since buying two of your books last month. 🙂 I do have one question: Regarding 2 of the whole wheat recipes: after I made the first couple of loaves, the surface of the stored dough hardened somewhat while in the refrigerator. Underneath this “hardened” layer, the dough was quite wet, just as I would expect. Is this “top, dryer layer” a problem? I wasn’t sure if I had unintentionally exposed it to too much air while refrigerating it. Thanks SO much! It is just as you suspect, there is too much air getting in your bucket. You can close the lid more or even snap it shut after a few days. I poke a small hole in the lid of my buckets so I can snap it shut, but allow the gas to escape through the tiny hole. Can you recommend a work around for baking without a bread stone? Thank you. This is such a great recipe! My sister Mollie and I bake for farmer’s markets in our respective towns. Here’s another one we’ve been making (her invention): Foccacia with blueberries and lemon sugar. It’s a winner! I have a quick question: I bake a large quantity of artisan breads for market every week. I let them cool thoroughly, and then put them in plastic bags for selling. The crust never stays the same. It always gets soft. Any way I could sell my bread in plastic without the crust going soft on me? Thank you so much for any help. Unfortunately, no. Plastic bag around the bread means you get a soft crust, because there’s no way to prevent the moisture in the crumb from redistributing to the crust. Without it though, it starts to stale at 2 hours, so you are in a bind. Which explains why fresh bread is so hard to buy! Both of these sound amazing! I’ve made a couple batches of your master recipe dough and loved all the loaves we’ve made from it. So much easier than all the kneading and rising time of traditional bread and I love the flavor. I’ve been experimenting with using spelt flour in the recipes and it works very well. I’d like to try a foccacia with sundried tomatoes but they seem to burn in the oven. Any recommendations for working with them? Yes– you need to re-hydrate them if they’re the kind that are packed dry– or soak them in oil overnight. I haven’t tried this, in our book we recommend the oil-packed ones, and those won’t burn the way you’ve experienced. You can use a larger pan or a smaller piece of dough and just stretch it a bit thinner. The high altitude tends to make the yeast expand wildly, so it may be playing a part in your high rising bread. Thanks, I will try maybe a half pound piece next time. On the plus side, it tastes incredible! Wow, focaccia bread is up there with my favorite bread, and this recipe looks to die for! I will have to try this very soon. I was wondering about specialty bake items, though. I’m anxiously waiting for the book to arrive, but from what I’ve read online, you need a pizza peel and baking stone. I don’t have either of these, at the moment. I’m trying to find a good one. Any suggestions? But until I can get those, is there any substitute I can use? I’m just dying to try this bread!! I just briefly want to thank you, as well. The fast replies, the book, and for this website. I can’t tell you how many times I get a book and try to contact the author(s) or somebody knowledgeable about the recipes and get nothing. It’s so refreshing to have a website and a book that can give me answers from experience with a specific recipe. Thank you for that! I also love that you have gluten free recipies. I am very eager to try those, as well! I am intolerant of gluten, although I do eat it in moderation. So being able to make and eat bread – one of my favorite foods – without worrying about eating too much and being sick, that alone makes the book worth it!! You don’t have to have a peel or stone. The peel just makes the process of getting the bread in the oven easier and the stone makes a crisper crust. You can start by placing the bread right on a baking sheet on a dusting of cornmeal or parchment paper to rest and then slip it into the preheated oven. You will still want to use the roasting pan for creating steam. Here is a gluten-free post that may be helpful: http://artisanbreadinfive.com/2010/01/05/gluten-free-crusty-boule We also have a gluten-free book coming out in October. Thank you so much Zoë! So when I’m placing the bread into the oven from the baking sheet, am I putting it on something (above the roasting pan?) such as a rimless baking sheet, or am I putting it on the rack? Thanks for the gluten free link! I will have to pick up those ingredients next time I’m at the supermarket!! I’m going to get the dough started right now. Will let you know how it turns out!! If you have a rimless baking sheet you can use it as a peel and have another baking sheet in the oven preheating. This will help the crust a bit, but you can also just rest the dough right on the sheet and slide the whole thing onto the rack when it is ready to bake. Both will work. Do all your gluten-free bread recipes have xanthan or another gum to make up for the gluten? Also, psyllium husk as replacement is no alternative for me, as I have difficulty digesting them. Ah! That I do have! I will try it with one sheet in the oven and my rimless sheet as a peel. That way I can mimic (to some extent) the job of the stone until I’m able to get one. Thank you for all of your help! I know I had a lot of questions! Sorry. I’m an idiot when it comes to lemons. Do you actually EAT the outer rind? Or peel it off. As long as I’m here, I would like to highly commend and thank you folks for sharing REAL information on your site, and not just force people to buy your books. You can just slice them thin and use them without peeling off the outer rind. Meyer lemons have a softer rind than regular lemons, so if you replace them with regular lemons you’ll want to make sure you slice them very thin. I used this recipe to make some focaccia and topped it with concord grapes, coarse sugar, and coarse salt, after I found a recipe for grape focaccia on “smitten kitchen” (here’s the link: http://smittenkitchen.com/blog/2010/09/grape-focaccia-with-rosemary/). It was really good, and the soft texture plus the crispy edges reminded me of Pizza Hut deep dish pizza. So I took a smaller amound of olive oil dough, flattened it, coated with olive oil in a cake pan, and let it rest 10 minutes. Then I topped it with pizza sauce, mozzarella, and pepperoni and baked it about 20 minutes, omitting the 2nd rest. It came out very good! I prefer thick crust pizza to thin crust, and this was more my style. I will definitely do this again! Hi! Is making bread with a “sponging” method or any other sourdough starter of my making compatible with your usual method of mixing the dough without kneading? Absolutely! Go to our FAQs tab and click on “Sourdough starter: can I use it with this method?” Keep the moisture content like what you’re used to in the recipes from our books. thank you, Jeff! You guys are the best!!! Thanks so much, Jeff! In fact, I tried baking with kneading and by your method. Sponging with your method produced very delicious focaccia! My daughter’s new favorite! Fantastic, glad it’s working for you! LOVE!!! Is dough freezer friendly? Can I make cinnamon sugar bread with this dough? If so how will the temp. and baking process (rising ETC.) vary?? I don’t see why not– Sweet doughs burn more easily, depending on how much sugar you put into the dough, may have to lower to 350. This will take experimentation. It doesn’t make as much difference as what people think. You can use it, just use a bit more water to keep the moisture level close to ours, otherwise not storable. Main difference for texture difference is the way it’s baked, not the dough. I’ve been making loaves with the olive oil dough recipe and brushing the top with olive oil and sprinkling it with fresh rosemary and sea salt. I would like more rosemary flavor in the bread itself but I wasn’t sure if it would hurt anything to put fresh rosemary in the dough since it will sit for at least a week. Oh, and thank you for the weights for all the ingredients in your book! My dough comes out perfect every time since I started weighing everything. Sure, you can put fresh herbs right in the dough, that’s no problem. I loved this bread, however, the slices of lemon seemed to leave the dough directly underneath under cooked. I discarded the slices of lemon as they were not Meyer and unpalatable. Is there a trick to not having under cooked dough underneath such as using zest possibly? The trick for me when using sliced citrus in baking is to use a mandolin, which is the only way I can get it thin enough that it will bake through in a reasonable amount of time and the dough underneath will also be baked. I stored the second half of the dough in the fridge until today (5 days apart). This time I used a regular metal (not cast iron tray). I spread it out more because I had bigger tray. But the focaccia has thick and hard crust. It’s done inside with good fluff/holes but the crust is a lot different. It’s hard to bite or chew the crust. Could it be that the texture of the dough changes as the days go by? Or was it down to the different tray? Or maybe I spread it out too thin? I did rise slightly like the last time and had nice bubbles on the surface but the crust is too hard 🙁 Can you help? Where did I go wrong? Did you bake it the same amount of time the second time? If so, that is probably why the crust came out harder the second time. The thinner the dough, the faster it will bake, so you’ll want to reduce the baking time if you get the dough thinner. You’re so welcome, I hope that solves the issue. I made this dough last night (this is one of my favorite doughs, by the way, love it) in preparation to make pizza tomorrow. I made the dough around 7pm last night, and then totally went to bed last night and left the dough on the counter all night. Do you think I can still use the dough? We keep our house pretty cold, it’s about 60 degrees or so. I stuck it in the fridge when I got up this morning (it actually looked pretty good, a little higher than normal but nice and flat on top like it’s supposed to be). I’d love to not have to throw it out! You are in good company, I’ve done this many times. The dough should be just fine to use as pizza. The dough may not last quite as long, but you should get a few days before the flavor is quite strong from the fermentation. Some people like that flavor and others find it too strong. Thank you! That was the answer I was hoping for. 🙂 I figured I’d probably need to use it up quicker since it fermented so long, but I’m glad I’m not the only one to forget about their dough… Thanks! Why bother with the cake pan? I just put my pizza stone in the oven when preheating, put cornmeal on my pizza peel, put the dough on there, waited 20-30 minutes, and slid into oven. Focaccia with onions and rosemary was delicious.